The courses we teach here at the school are focused on a totally new way of understanding health and disease - using subcellular and developmental psychobiology. This new approach allows us to find the biological causes for many mental and physical disorders of previously unknown etiology. Not just an academic curiosity, this new approach has also allowed us to develop psychoneuroimmunological techniques that actually eliminate diseases and disorders that have never been able to be treated before, let alone understood. The school has evolved quite significantly over the last two decades. It was originally an integral part of the research efforts being done by the Institute for the Study of Peak States (based in Canada). The courses were designed for therapists who needed better ways to treat mental and physical disorders and diseases; but many of these therapists also were also volunteers in our research, indirectly helping us to improve our understanding and techniques in the totally new field of subcellular and developmental psychobiology. In 2014 we reached an internal milestone, when new solutions to various safety issues finally allowed us to go public. 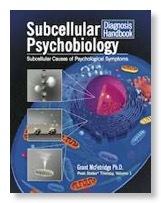 (See "Going public with subcellular psychobiology".) And so in response to this, the school has changed its emphasis. In addition to a research focus, we feel it is now time to share this fundamentally new way of understanding and treating illnesses with other professionals in medical and academic environments. We want to promote a more rapid development of this new technology, in order to effect global change in disease treatment and healthcare. If you have more interest in the current research activities at the Institute, or want to understand exactly what subcellular psychobiology is, we refer you to the Institute for the Study of Peak States' website at www.PeakStates.com. 1985: In the late 1980s, Dr. McFetridge started to work part-time on the question of why some people have exceptional mental and physical health - hopefully to find a way to make this possible for all people. 1995: By the mid 1990s, considerable progress had been made. To study this problem, Dr. McFetridge had developed a new approach to prenatal regression (the Whole-Hearted Healing technique) that allowed him to investigate prenatal, perinatal, and post-birth events. Using this regression technique, he was able to observe that there were self-aware triune brain structures interacting in the developing fetus.The technique also allowed him to actually test his developing hypothesis that trauma at key in utero developmental moments was the primary block to exceptional well-being. During this period, he also formalized the new paradigm of 'peak states' of consciousness - before this time, no one even considered the possibility that people could have permanent, exceptional states of well-being. 1998: By the late 1990s, Dr. McFetridge had attracted other colleagues into this effort (Mary Pellicer MD, Adam Waisel MD, Marie Green PhD, Deola Perry PhD, Wes Gietz, and others) and founded the Institute to act as a focus for this research work. They started to present the regression technique at conferences and to teach it in workshop settings. These early training classes served two purposes - it gave a trauma-healing tool to therapists, and it inspired other professionals to get involved with the research efforts. The first Institute website goes online this year. 2002: In 2002 the Institute made a completely unexpected, fundamental breakthrough - the discovery of the primary cell, and hence the resulting field of subcellular psychobiology. Because of the quickly apparent safety issues with this new discovery, this information was kept restricted to the research staff for many years while they grappled with trying to understand the problems that were being encountered. 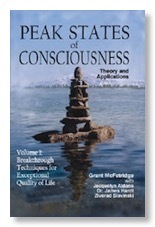 2004: In 2004 Dr. McFetridge's first book on 'peak states' of consciousness was published, based on the research work over the previous decade. Dr. Pellicer and Dr. McFetridge gave their first training focused on this topic that same year. Also during this year, due to their research work on hemophilia, they realized that trauma techniques were actually working on epigenetic damage to the histone sheaths of genes, inhibiting gene expression. 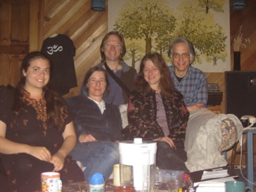 2005: In the second half of the decade, the volunteers at the Institute began to teach more and more professional courses in North America as well as in Europe and Australia. Although these courses were designed for therapists who were treating clients, the research staff used these trainings to help them test their understanding of subcellular and developmental psychobiology and its applications. Hence, they put extreme safety protocols in place, and therapists signed agreements to not use or share material the Institute staff felt was still too untested for clients. 2006: The Institute also started a certification program. 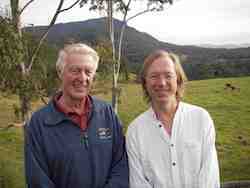 Nemi Nath, the past president of the World Breathwork Federation, joined the Institute and worked on this project. Unlike most certification programs, it was designed to help these unusual therapists stay updated in the rapidly changing discoveries and techniques. And because this whole field was so new and experimental, it also allowed the Institute's newly formed worldwide clinics to act as a backup support structure for those therapists using these new approaches to healing. 2007: Dr. McFetridge had always emphasized 'charging for results' in the Institute's courses, but in 2007 the Institute made it mandatory for therapists who wanted to be certified with the Institute. Ethically, it was important that these new, somewhat unreliable techniques would not waste client's money; but it also solved the problem of therapist quality control, and gave immediate feedback to the research team when a new process or technique was not working properly. 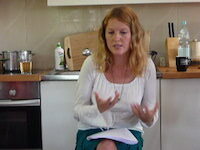 The Institute's website now listed these pioneering therapists who embraced this new way to charge and treat clients. 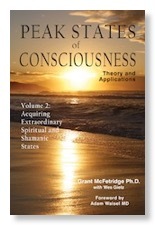 2008: In 2008, Dr. McFetridge published Volume 2 of Peak States of Consciousness, a much more in-depth book for researchers and professionals. This book first introduced the primary cell discovery to the public. 2010: By 2010 the Institute had made strides in developing and applying developmental psychobiology to psycho-immunology, in order to directly eliminate diseases that were causing mental and physical disorders. The first application of this was a technique that eliminated the fungus that caused schizophrenic voices. 2011: More importantly from a safety perspective, in 2011 they finally solved the cause of serious pain symptoms in some clients triggered by their attempts to heal (when using any therapy, not just techniques from the Institute). With this breakthrough, the school resumed teaching courses after a three-year hiatus. 2012: Up until now, in spite of all the work and fundamental discoveries, the core purpose of the Institute had not been accomplished. There still was no understanding of the causes of fundamental problems in consciousness. However, after 27 years of work, in the early spring of 2012, these issues were finally understood as the byproduct of inherited subcellular parasite diseases that could be classed in just three distinct groups. And a new, simple technique for eliminating body associations was developed for addictions. 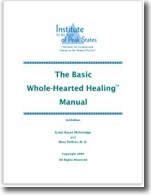 2013: Paula Courteau, a key member of the research team, published her book for self-help called The Whole-Hearted Healing Workbook. This became a textbook in some of our courses, and introduced her projection technique to the general public. 2014: And in November of 2014, with safety issues adequately handled, the Institute finally went public with their work in subcellular psychobiology with the publication of a diagnostic handbook for professionals. 2015: On the research side, the team is applying their efforts to specific, serious diseases that have no current treatments in standard medical practice. They are also focused on exploring a new breakthrough in treating classes of diseases en masse, rather than in a piecemeal basis. It is a very exciting time to be in this field!